A pair of lounge chairs by Molteni. 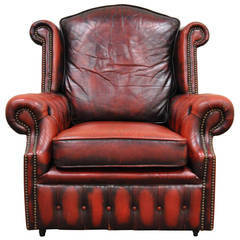 Down cushions, the whole frame is meticulously wrapped in leather. very good original condition with very minor signs of very light use. A pink leather postmodern lounge chair. Round back on a simple waterfall seat with chrome feet. Very plush. 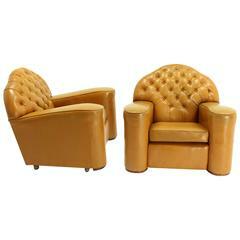 A pair of surreal lounge chairs. The back envelopes the seat and become the front legs. The shape is balanced by a wood tail like third leg. 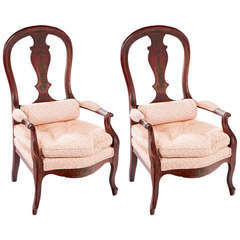 A pair of teak lounge chairs. Solid chunky teak with faux bamboo design. The teak has acquired a wonderful gray patina. New upholstery. Suitable for indoor use as well. A pair of midcentury chairs with wonderful animal legs. The wood legs are finished in silver gilt. The seats are upholstered. Great design that is stunning from every angle. 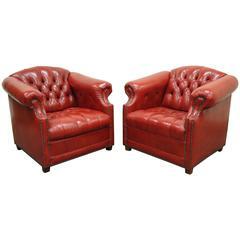 Pair of outstanding unusual design chesterfield leather lounge chairs from circa 1950s.